Sooty mold on plants you’ve seen it. The black soot formed on the upper leaf surfaces of plants. Sooty mold can be a real problem on garden plants. Many people are unaware of the connection between honeydew (produced by sucking insects such as aphids (aka plant lice), scale insect pests, and white mealy bugs) and the development of sooty mold. In this article, we share seven frequently asked questions along with answers to help explain the connection and provide advice on dealing with these problems. Read on to learn more. This sweet-sounding, sticky substance is actually a waste product of scale insects, mealybugs and aphids. 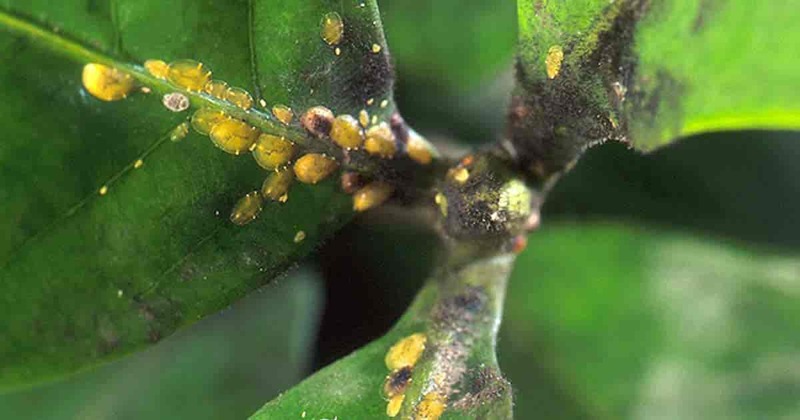 As the pests excrete the sweet substance, it spreads a coating and sticks to leaves, stems, flowers, and fruit. This sugary substance is a by-product of this particular type of insect digestion. The insects want the protein from the plant sap. The sap is very high in sugar and very low in protein, so the pest must consume vast quantities to get the protein they need. Because they cannot use sugar, it just passes right through their body and is excreted on and around the plant the insects feast upon. When you find this sooty mold fungus on and around your plants, perform a careful inspection. You are sure to find a cluster of these pests lurking in the nooks and crannies. If you treat the pests successfully, you will no longer have a problem with honeydew and sooty molds developing. Sometimes, honeydew is unnoticeable until after the black sooty mold has already begun growing. On the other hand, if you have a serious aphid infestation, you may find the sticky honeydew on surfaces surrounding the afflicted plant. This can give a heads-up for you to take steps to prevent the black plant mold before it begins. #2 – Why Is Sooty Mold Bad? This fungal growth covers the surfaces of leaves, flowers, and fruit blocking light and air circulation. Since all plants need light and air to survive and thrive, blocking the light is not a good thing. In very severe sooty mold attacks a plant may become entirely black and even kill a plant. Luckily, this fungus does not take hold on plants. It only grows on the surfaces, so you can help affected plants by simply wiping it off with a neem oil and water solution. A variety of different fungi can develop into sooty mold. If you are curious, you can culture the infestation and find out which variety is plaguing your plants. In all instances, treatment is the same. These pests are tiny and very easy to overlook until there are lots of them. Tiny green aphids may be especially hard to see. Look carefully on the undersides of leaves and on plant stems. They tend to congregate in groups, making it a little easier to get rid of them. If you see ants around your plants, be sure to check for aphids. Ants really like honeydew and will flock to aphid-infested plants to gather it. In fact, ants have even been known to cultivate and “farm” aphids to ensure a steady supply of honeydew. Ants move the pests around on the plant to increase their yield, and they have even been observed squeezing aphids to “milk” the honeydew from them. Clearly, keeping pest numbers low or non-existent is the key to preventing sooty mold. #4 – What Plants Are Hardest Hit By Sooty Mold? If you have an apple tree affected by aphids, you may notice the apples look dark. This is because sooty mold has begun to develop. Luckily, you can simply wipe the mold away with a cloth dampened with a white vinegar and water solution. Be sure to take steps to get rid of your honeydew-producing pests to prevent further damage to your fruit. #5 – Why Do Some Trees Seem To Drip Sticky Stuff? Have you ever parked under a tree only to find your car covered with sticky stuff when you return? Have you ever stood under a tree on a warm, clear day and felt “rain” falling from the leaves? In both of these instances, the tree in question must have been severely infested with scale insects, aphids or mealybugs. Even a cursory glance at such a tree would probably reveal darkened black leaves, stems, flowers and fruit because of sooty mold. #6 – Are Indoor Plants Safe From Black Sooty Mold? Unfortunately, anywhere aphids and their tiny cousins can go, honeydew can be produced and sooty mold can grow. It can be especially problematic in large, closed, heated situations with lots of plants, such as a greenhouse setting. When you have a lot of plants congregated in one place, it is especially important to be vigilant and take preventive steps against pest infestation and all the complications that accompany it. #7 – How To Prevent Honeydew And Sooty Mold? Remember that honeydew-producing pests may also spread disease and viruses from one plant to another, so it is especially important to get rid of them quickly and efficiently. Outdoors (or even in a greenhouse or sun porch) cultivate natural predators, such as ladybugs, assassin beetle bugs and mantis. In the garden, encourage birds, especially little ones such as hummingbirds that can flit into small places in search of tiny prey. 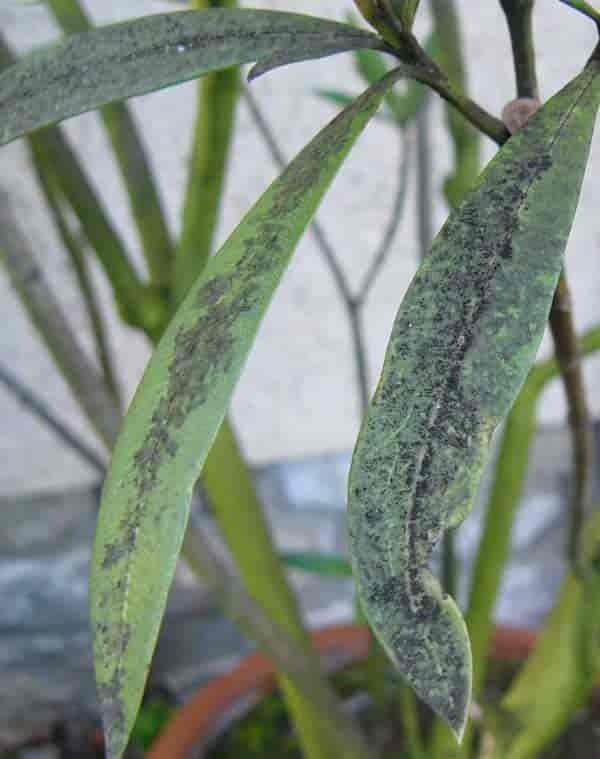 Examine your plants frequently and use a neem oil solution to wipe the bugs and sooty mold away when you see it. Use a neem oil foliar spray on a regular basis to discourage pests and mold growth on your plants. Chemical products may negatively impact your natural predators such as aphid loving ladybugs, assassin beetle bugs, praying mantis and more. A gentle neem oil solution, natural insecticidal soap solution or one of the horticultural oils used in a focused manner will help keep pests under control with minimal impact to your beneficial insect population.